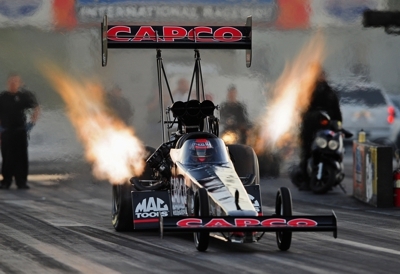 February 6, 2012 -- Steve Torrence’s love of drag racing began at an early age as he watched his father race and it has grown into a passionate avocation that finds him eagerly awaiting the launch of his first NHRA Full Throttle Drag Racing season as a Top Fuel team owner. The Torrence Racing/Capco Contractors Inc. crew has three 2011 races on its performance chart – including an October semifinal finish at Phoenix – and a busy pre-season test session in Florida. There is an abundance of anticipation in his voice when Torrence talks about the 23-race 2012 campaign that begins Thursday with the 52nd O’Reilly Auto Parts Nationals at Pomona, Calif. and moves to Phoenix on the following weekend. “I’m really excited,” said Torrence, of Kilgore, Texas. “We were able to get a few races under our belt last year and collect some (tuning) data during testing last month. The crew regrouped after the test session and got ready for the first two races. Hogan assisted Torrence in creating his dream team last year, selecting the six-man crew while filling their Brownsburg, Ind. race shop with thousands of parts and pieces necessary to maintain a competitive nitromethane-gulping dragster that can travel 1,000 feet in less than four seconds at speeds in excess of 300 mph. “I have a lot of confidence in Richard and all of the guys,” Torrence commented. “They have the cohesion among them that is important in a race team. We have all the parts and all the right people. 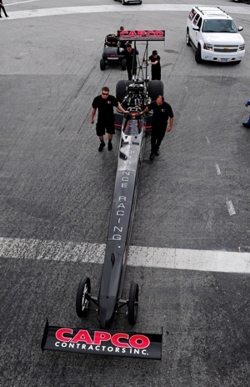 This will be Torrence’s second season seeking a berth in NHRA’s six-race Countdown to the Championship. He finished eighth in 2010 in his initial campaign while driving for Dexter Tuttle’s team and he was the only newcomer in the top 10 to claim a playoff berth. Hogan also grew up in a racing family in St. Petersburg, Fla. His dad raced while Richard opted for the mechanical side of the sport. Hogan worked with drag racing icon Don Garlits in the early 1980s and he added to the knowledge during the following years. “We ran very well in those early years with Garlits,” Hogan said. “I learned a lot from him. I didn’t go to races all the time, but I went to a big percentage of them. Those included Dale Armstrong, Alan Johnson, John Mitchell, Jim Brissett, Larry Frazier, Bob Noice, Terry Major, Wes Cerny and Walt Austin.